We want to present you with the best product possible, including all the information you desire. Suspender Buttons in Front and Back. Herringbone Wool Fabric. 1" Cuts at the bottom of each leg to accommodate pac boots, snow boots, logging or hunting boots. 2-Side Pants Pockets. 1-Coin Change pocket in front. Rise = 11.5". - Inseam = 32.5". Hi for sale are the pants pictured above. They are new with tags and will be shipped within 24 hours of payment received on business days. Check out my other items as I will make shipping as cheap as possible on multiple purchases, just please do not complete checkout until I can send you an updated invoice. If you have any questions please feel free to ask me. Thanks for looking and have a great day. Tag says 36 x 34. Measures 34 x 31. Legs quickly zip off to convert to 10" inseam shorts. Size & Fit. Crafted from 100% cotton canvas. Back flap button-through pockets. L.L. 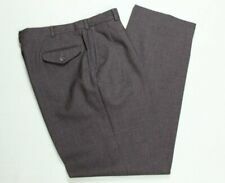 Bean Double L Classic Fit Chino Khaki Pants Men’s Size 34x30 Pants Stk59. Condition is Pre-owned. Shipped with USPS Priority Mail. Small spot on the front of Pants. Please see pictures. Otherwise in great condition. LL Bean Classic Fit Plain Front Khaki Pants Size 34 with inseam measuring 32” Condition is Excellent Shipped with USPS Priority Mail. No apparent wear. In excellent used condition. Rugged 100% cotton canvas. Waist not stretched- 33". Machine wash and dry. Natural Fit: Sits at the natural waist and relaxed through the hip and thigh. Guys Size 34W X 30L~L L BEAN~5 Pocket Jeans~ 88% Cotton~~10% Polyester~~2% Spandex~ Excellent Condition~~~~~~Brass Fly Zipper~~~Metal Logo Button Save With Free Shipping 16 YEARS OF SATISFIED CUSTOMERS. 85 percent wool, 15 percent nylon. Inseam / Length: from the crotch seam to the bottom of the leg, with the pants laying flat. Inseam: 31". made in the usa. We are reasonable people. We do, however, reserve the right to make the final decision, in this regard. Vtg LL Bean Brown Wool Tweed Hunting Pants 34 x 27 USA Made Suspender Buttons. Condition is Pre-owned. Good Used condition. Has piling throughout. Comparing these to the others listed, I think they might be 100% wool. However, since there is no fabric content tag, I don’t know if It is a blend or not. Made in the USA. Brown with tones of tan and gray. I took photos of different angles, to try and show its true color. Has suspense buttons on the inside. Waist 34 inches Rise 12 inches Inseam 27 inches Thanks for looking! Waist 18". Inside Length 30". Color: Beige (See Photo). Waist: 17". Mistakes happen. I WILL work with you! Fabric: 100% Cotton. IN EXCELLENT CONDITION. FLAT FRONT, 100% COTTON. STANDARD FIT. Khaki Cargo Pants. by LL BEAN SIGNATURE. SIZE→ 34 x 34. Length→ 42.75". Back Rise→ 14.75". Front Rise→ 9.75". Inseam→ 33.5". Very good, gently used condition with minimal wear. No fraying at leg opening. Waist measures 17” when laying flat, inseam is 30.5-31”, and leg opening is 9”. Feel free to message me with any questions and I’ll get right back to you. Item Specifics: Classic Fit unfinished inseam. Color: black. This item is in Excellent Used Condition! We are only human and may make a mistake once in a while. NOTE: Colors may vary between. GREAT GIFT IDEA! These have been dry cleaned and well taken care of - there is one small unnoticeable spot on the back pocket as shown in the pictures.